Every day people are opting to use motorcycles more and more as an alternative form of transportation. The fact is that motorcycles provide many advantages over cars and if you are usually driving alone you can greatly benefit from using a motorcycle instead. The low fuel consumption, higher speeds, and smaller space it takes up makes it ideal for quick trips and reaching places faster. Of course, motorcycles are not solely used for transportation many are used for competition or just a weekend trip to some nature trails. That is why today we want to discuss some of the different types of motorcycle classifications you may encounter. All motorcycles, need to be cared for and maintained. Since these vehicles do not have as much outer protection as a car or truck you need to be more careful and stay on top of all necessities. That means the tires need to be in good shape and the brakes well maintained. All fluids must be sufficient and of good quality and especially the motor oil. Just like in other vehicles, lubrication is a basic necessity for the motorcycle´s engine. Use a quality synthetic oil for better results and greater protection. Contact Mooresville Synthetic Oil today and get the best AMSOIL products for the maintenance and care of your motorcycle. Standard. When referred to a motorcycle the most common and general type of bike are this type. Standard motorcycle bikes are usually for the streets and use around the city and traffic. Their upright position characterizes them because the foot pegs and handles are well accommodated so that the rider will hardly have to lean forward and it also doesn´t require that they lean very much towards the back. These models are usually less expensive than the rest and are perfect for beginners. Cruiser. Although there are several different brands of cruiser bikes, the most legendary and well known is the Harley Davidson. This brand has become almost a synonym for the cruiser bikes that have a stylish yet relaxed structure. The higher handles and lower seat create a more laid back posture for the rider and their commonly large engines are usually tuned to be less demanding. This creates a less frequent shift for acceleration and also facilitates control. The more relaxed position that it permits the rider also means that it is quite comfortable for riding at lower speeds but when having to ride at higher speeds for a longer period it can become more uncomfortable because of the need to resist the wind while pulling back on the handlebars. Touring. These type of more specialized bikes are adapted for longer rides and more luggage. The larger engine displacement and bigger capacity fuel tanks make them ideal for longer trips and road trips. The seats also tend to be bigger and much more comfortable than those in other types of motorcycles. They are designed for a more upright position for more comfort. These types of motorcycles can be quite heavy and large in order to accommodate to comfort but some even have a reverse gear in order to facilitate their backward movement out of tight spots. Sport. For those that have a greater need for speed, there are sports motorcycles that are incredibly equipped for greater acceleration. The powerful engines of these motorcycles let them reach high speeds. However, this also means that they tend to be less fuel efficient than other bikes. Sports bikes are also created to have better handling and braking, especially in concrete and paved roads. Yet, their position is less comfortable and riders usually need to be tilting forward and the body is closer to the bike. Off-road. The next type of classification for bikes is that for unpaved roads, dirt trails, and more natural tracks. 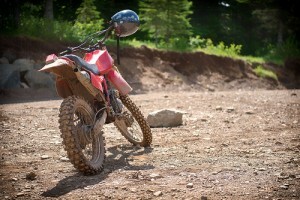 These include dirt bikes that are used mostly for trails and dirt paths and dual-sports bikes which are adapted for both dirt and paved roads. The tires and suspension on these type of motorcycles are more adapted to the difficulties of the road. The tires have a better grip in order to perform well on rough roads and they also tend to be higher than other bikes. For some examples of off-road bikes visit Honda´s page, here. No matter what type of vehicle or bike you have, a synthetic oil change can help transform the performance of the engine and proved greater durability for your machine. Contact Mooresville Synthetic Oil at (336) 247-0212 today and get AMSOIL synthetic oil to increase the durability of your motorcycle.